I have been meaning to write about tomatoes for ages now but prettier things keep cropping up. To me, tomatoes are the most important crop of the year. There are many reasons for this but one of the main reasons for growing your own is to eat crops when they are at their peak of taste and ripeness and you really cannot buy tasty tomatoes. I know this is not quite true and if you pay a premium you can get nice ones. But I don’t always want red tomatoes; I want yellow, orange or pink ones. And I love big beefsteaks that can be sliced and put between two slices of bread, with some salt or balsamic, to make the best sandwich of the year. So I need to grow my own. 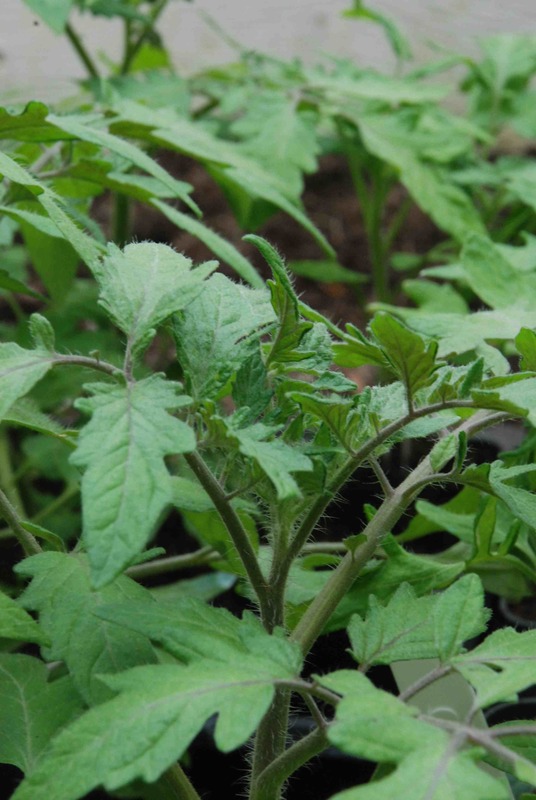 It is wonderful that UK seed catalogues, and others, have hugely expanded their range of tomato seeds and it is relatively easy to get unusual tomatoes these days and breeding goes on so there is a constant flow of new, but interesting and non-commercial varieties we can try. But that does not stop me growing old or rare ‘heirloom’ (or heritage) tomatoes every year. Now although these can be fantastic they do have their problems. There are lots of reasons to grow heirloom tomatoes. For me it is their amazing diversity and the chance to grow something that has a direct link with the past. It is a great honour to be able to grow a tomato that is the same that was grown 100 years ago in Germany or the USA. Or to grow something that was maintained for decades by a small group of people. On a wider scale it is important that these varieties are maintained so that we do not lose this diversity and even if I don’t keep the seeds myself and go back to a supplier to buy them, by producing demand I am doing my bit to maintain them. But it must be said that, if you are looking for reliability and big yields, you may be better off sticking with common varieties or even modern F1 hybrids. Now I am not going to ruin my argument for heirlooms by suggesting that you grow ‘Moneymaker’ even though it could be argued that it is a UK heirloom now. And I know it could be argued that F1 hybrids are taking over the world and reduce genetic diversification but, being pragmatic about it, they are bred to be easy to grow, anywhere. I will not get into whether the fruit actually taste any good because much of the taste of a tomato is influenced by how it is grown and how ripe it is when it is picked. The joy and the problem of heirlooms is that they are usually a regional variation maintained by a small population because it is perfectly suited to that region. So it is great that I can grow an orange tomato from Kentucky or a big red oxheart from Arkansas. The trouble is that I don’t live there and because I will be growing the tomato in an area that is not where it made its name it may not perform well. I am not saying that all will fail, just that you have to take the rough with the smooth so if a variety is less than you expected, don’t blame the plant! This is similar to someone wanting a wild-flower meadow. They add a wide range of flowers and after three years only dandelions, a few geraniums and prunella remain. You are creating a dynamic system and the speciation is going to vary. But also not all wildflowers grow in all areas – some are more suited to alkaline soil or acid soil and you can’t have them all. Anyway, back to tomatoes. Most of my plants are late this year because the Feb. 6 sowing were damaged. So I had to resow on March 25 and that means my plants are much smaller than I would like. It is important that you do not plant out the seedlings from their pots until they show signs of flower buds in the top of the plant. This mild stressing encourages them to start fruiting and if you do not do this they can get very tall before they bother to bloom. 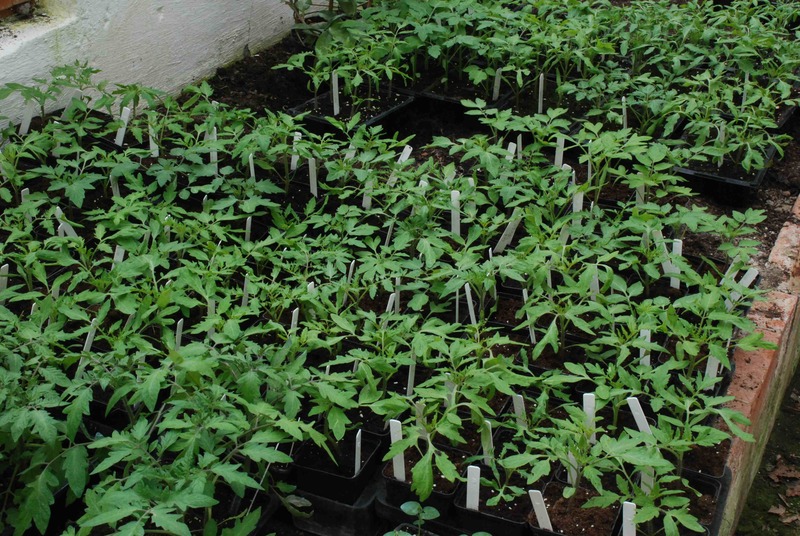 That doesn’t mean you have to starve them – I feed the young plants regularly to keep them healthy. But they will not be planted into the beds for a few weeks yet. still no signs of a flower bud and my plants are not looking so good now . not so green and I think looking a bit tall and thin in the pot . have put some out in cold frame to harden off . and have greenhouse ready for indoor ones. do you just use tomatoe food sparingly while they in the pots?